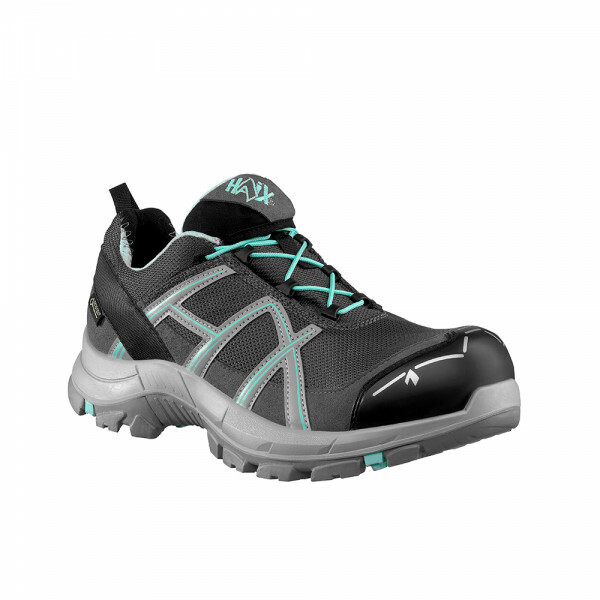 Informazione prodotto "HAIX Black Eagle Safety 40.1 Ws low grey/mint"
Maximum comfort and protection: The HAIX Black Eagle Safety 40.1 Ws low grey/mint safety shoes offer you this. With these Workwear shoes, your feet will not hurt even after many hours of work. This is ensured by the comfortable footbed and the optimum cushioning of the work shoes. This model is especially designed for women's feet and impresses with its optimised fit. The soles of HAIX shoes are equipped with a puncture-resistant metal-free insole. Thanks to three different insoles, you can adapt the shoes perfectly to your feet. It is shipped with the red inlay (medium) as standard. You can order additional Vario Fit insoles here. A high-tech CROSSTECH® membrane protects your feet against the wet. It also offers protection against blood and other body fluids. This keeps you safe against any potential viruses or bacteria. Special orthopedic insoles can be used in this safety shoe. The sole provides outstanding insulation against heat and cold. It can therefore be worn all year round. The material mix of microfibre and textile is extremely breathable, so that fresh air always comes to your feet. The quick-release fastener ensures smooth and pressure-free adjustment of the shoe to the foot. An additional toe cap at the tip of the boot makes it particularly hard wearing and durable. The slip-resistant HAIX Black Eagle Safety 40.1 Ws low grey/mint provide a good foothold and firm footing. This is guaranteed by the durable outsole made of special rubber. It ensures good adhesion on virtually any terrain. The shoe also features a bold tread for extra traction.